If you are looking to grill and don’t want to break the bank then Dyna-Glo should definitely be a consideration for your next grill. There are a lot of choices out on the market when it comes to grilling but finding a grill that is both affordable and good quality is a heck of a challenge. So today we will see if this more affordable grill from Dyna Glo is a quality product or not. So anyway, to the actual review. First off let me talk about the grills design. 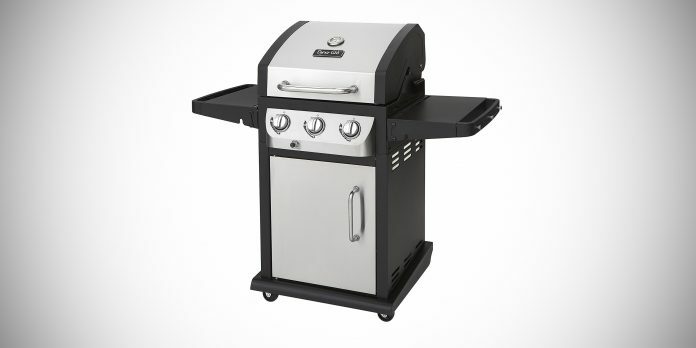 There are in fact 2 variations in this 3-burner grill – one simply has a bronze color scheme whereas the other is stainless steel. I personally used the stainless steel one which Iooked surprisingly high end. In terms of the form factor I would say it doesn’t use up that much space. The side panels which can be used for food preparation or whatever you need can also be folded down which makes using it or storing it in tight places more convenient. As I mentioned storage – the grill has wheels on the bottom which makes for moving it around very simple and convenient. 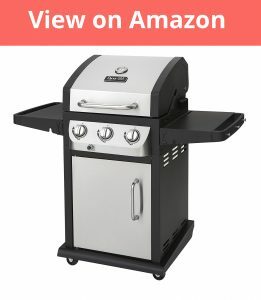 A lot of people may have the concern of setting up this grill but when compared with all the other grills I have used this is easily one of the easiest to set up. The instructions are very clear and are easy to follow and only took me about 1 hour and I didn’t need any help from a friend. As the name of the grill would suggest it has 3 burners. Having 3 burners not only means you have more area for grilling but this also helps keep the cooking area heat more consistent which is great. In my usage the heat was evenly spread and everything cooking at the same rate no matter where it was placed on the grill. It’s also worth mentioning to start these burners there is an electric starter which really works a treat – it’s just a matter of holding the button down and then the sparks ignite each of the 3 burners. Each of the 3 burners can be adjusted individually as you need using the front dials. For the actual heat, this grill can easily get over 550F and this was in a very fast time as well (only a handful of minutes). There is a built-in thermometer so you can actually see the temperature as you are grilling which is a nice addition. With the grilling area you also have a raised-up area above the main grill – this is idle for placing some food to keep it warm while you wait on the other food to finish cooking. I also personally used it for toasting up some of my bread which was handy. A common problem I have with some cheaper grills is the grease management system and how poor it is. Though with this Dyna Glo things couldn’t be more different. The grease tray here is a tray that can slide out, it is deep and has a Teflon coating on the surface. This basically makes for cleaning much easier. I simply removed it after cooking and then poured out the nastiness and then added some water and washing liquid and after a quick scrub is was good as new – nothing got stuck onto it mainly thanks to the Teflon I think. Usually I can find a common fault or a problem with a grill but here I can’t really. Though maybe an addition of a cover to protect it from the weather would be been a good addition to have. 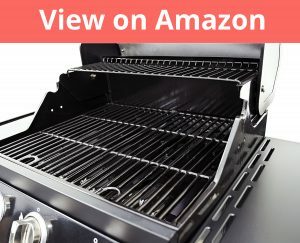 Overall this grill is fantastic, it offers everything you would expect from a higher quality grill but is almost half the price – this is an easy recommendation for me to make. Can this bar-b-q be converted to natural gas. With a conversion kit? I did some research and I don’t believe it can be. Though I did read someone converting it through some handy work but not with a conversion kit.